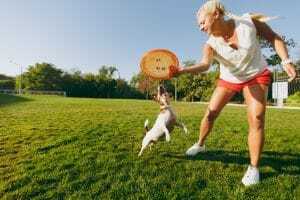 Woman throwing orange flying disk to small funny dog, which catching it on green grass. Little Jack Russel Terrier pet playing outdoors in park. Dog and owner on open air. Animal in motion background.